A Cornflower, or bachelor's button, is a plant belonging to the genus Centaurea, especially Centaurea cyanus. It is an composite herb (member of the family Compositae or Asteraceae) with compound inflorescences, structurally similar to those of the dandelion. The flowers are most often blue, but can be other colors as well. The plant is native to western and central Russia, but has been widely introduced throughout Europe, North America, and central Asia. 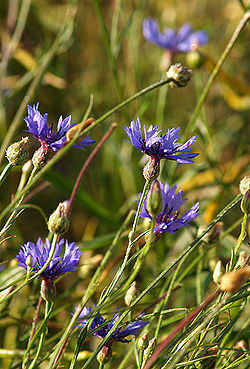 In some parts of Europe, the wild cornflower is a weed. In the "language of flowers" or floral symbolism, the cornflower symbolizes contentment with unmarried life. It also is a symbol of the CIS (formerly USSR), and represents abundance when it is depicted in Russian heraldry. This page was last modified on 30 July 2010, at 14:01.